Welcome to Lucky Lane Carriage House! Stairway leading up to the home. Comfortable Living Room. 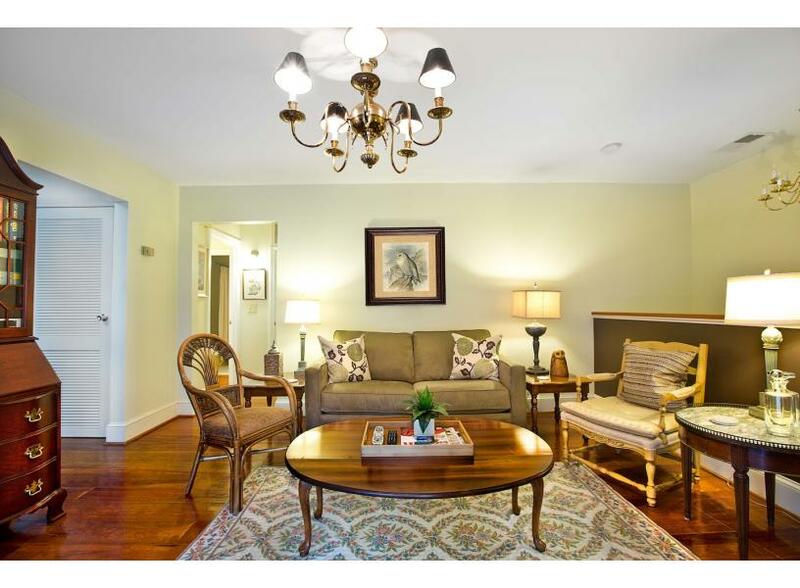 Light and Spacious Living Room with large french doors. The living room with a sleeper sofa. Eat breakfast in the quiet of the morning here. Looking into kitchen from dining area. Fully equipped kitchen for whipping up family dinners. Elegant four poster bed. Beautiful and restful king size bedroom. Bedroom looking into the full bath. Modern, bright and spacious bathroom. 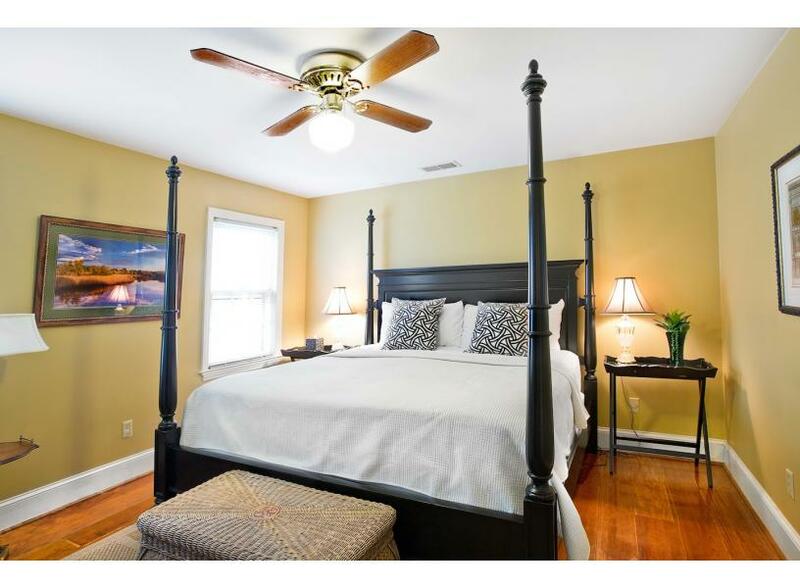 Located on the second floor, Lucky Lane Carriage House is part of the same Gaston Street property where our Gaston Garden Apartment is located. 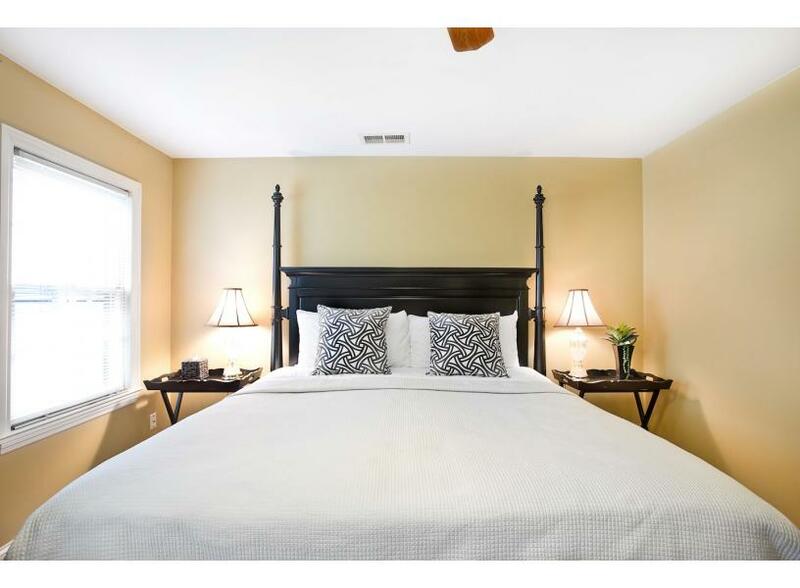 Located just off of Abercorn Street in the Historic District, this one-bedroom, one-bath home comfortably accommodates up to four Lucky guests. 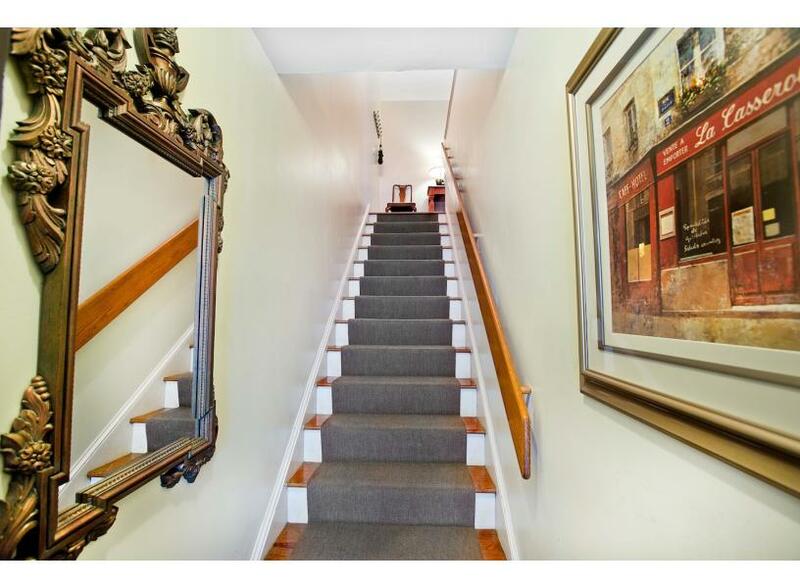 You’ll find a light and spacious living room at the top of the stairs, with French doors leading to a small balcony. Enjoy your morning cup of coffee in this enchanting spot, overlooking the greenery in the courtyard below. 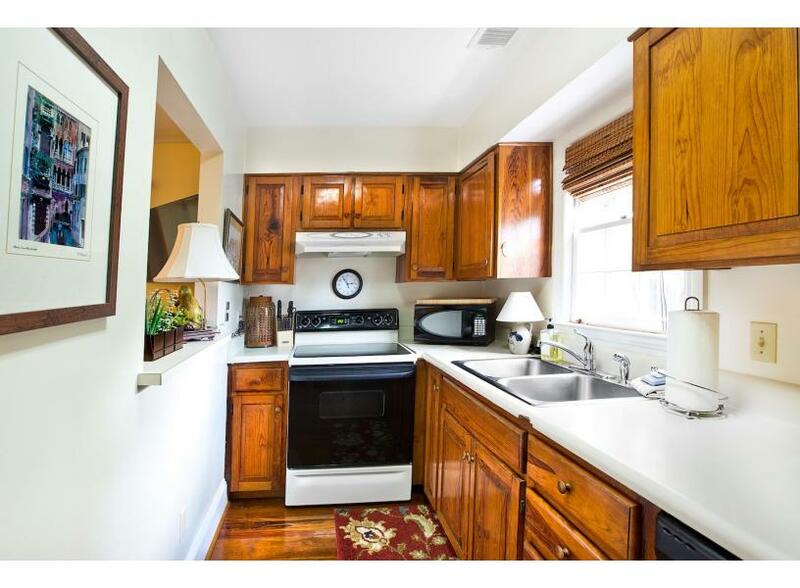 The adjacent galley style kitchen has everything you need to prepare a home cooked meal or just refrigerate leftovers from one of Savannah’s many restaurants. 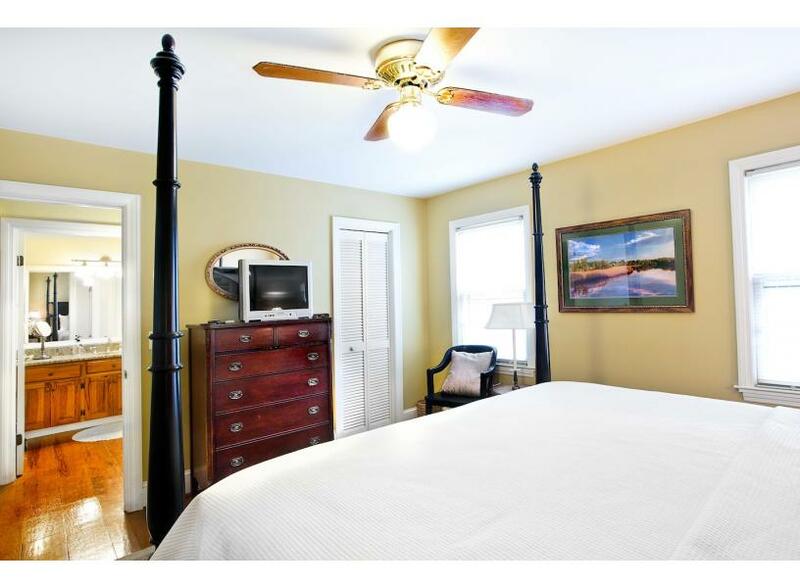 The king sized bedroom has an elegant, four-poster bed, dresser, TV, and closet. 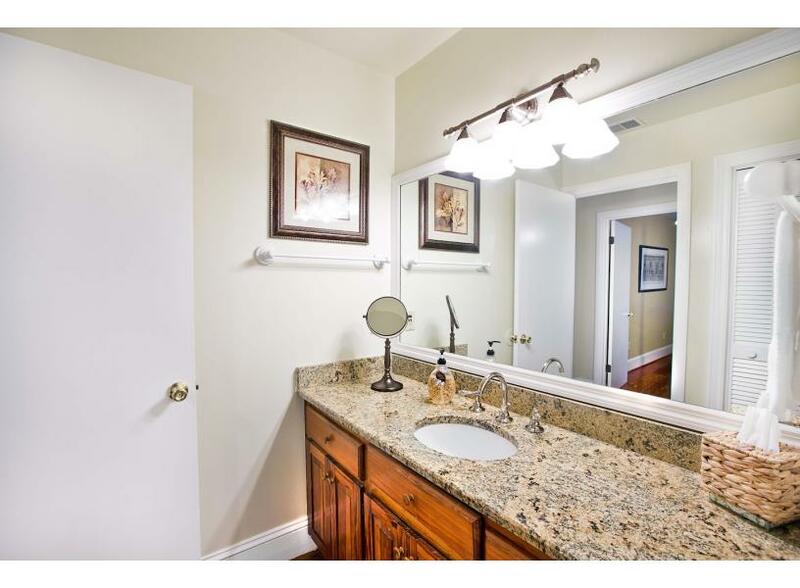 The bright, modern and spacious bathroom has a large vanity and a shower/tub combo. Enjoy a Saturday morning stroll through the Farmer’s Market at historic Forsyth Park or browse antiques at nearby Alex Raskin’s. You’ll be near some of the city’s top eateries, including 700 Drayton, Clary’s, and Local 11 Ten. 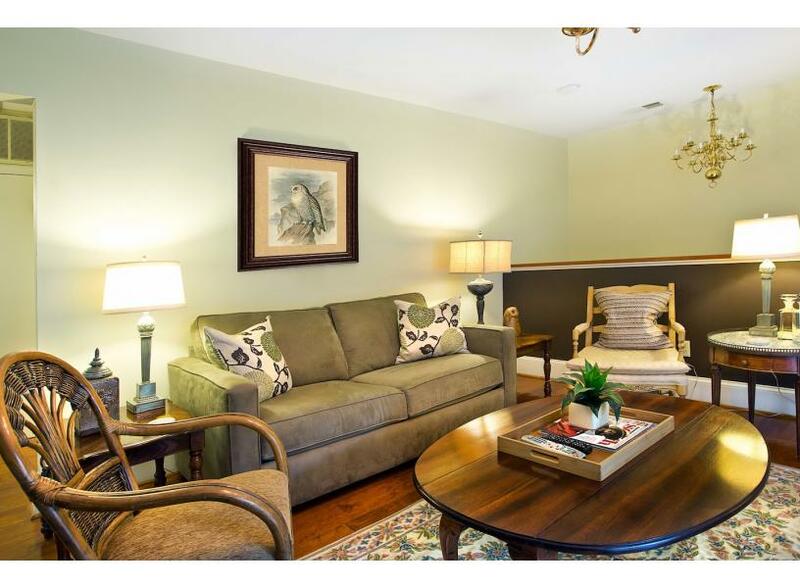 Lucky Lane Carriage house is the perfect location to enjoy all Savannah has to offer. - You’ll be just a short stroll from the only full-size grocery downtown, or talk to us about having your fridge stocked before your arrival. 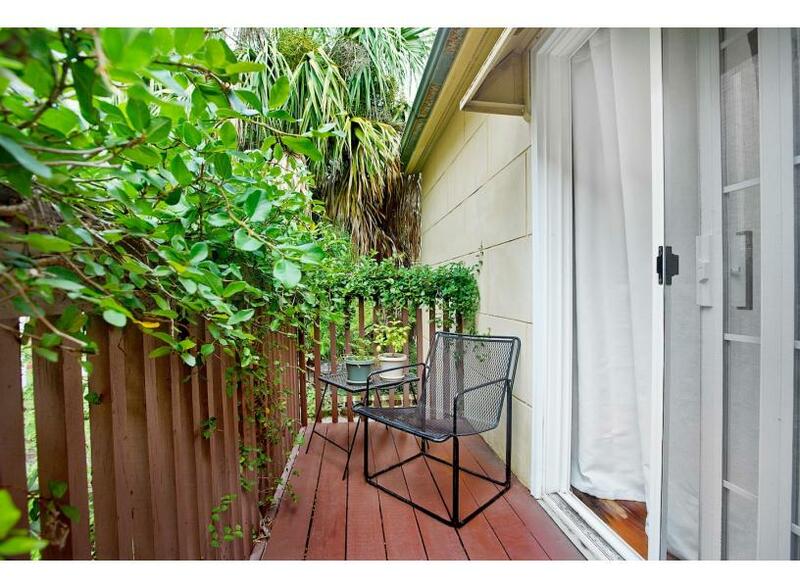 - The property has a washer and dryer, making it perfect for extended stays. - Tour the famous Mercer-Williams House on nearby Monterey Square. We had a wonderful time in Savannah and at Tybee beach! 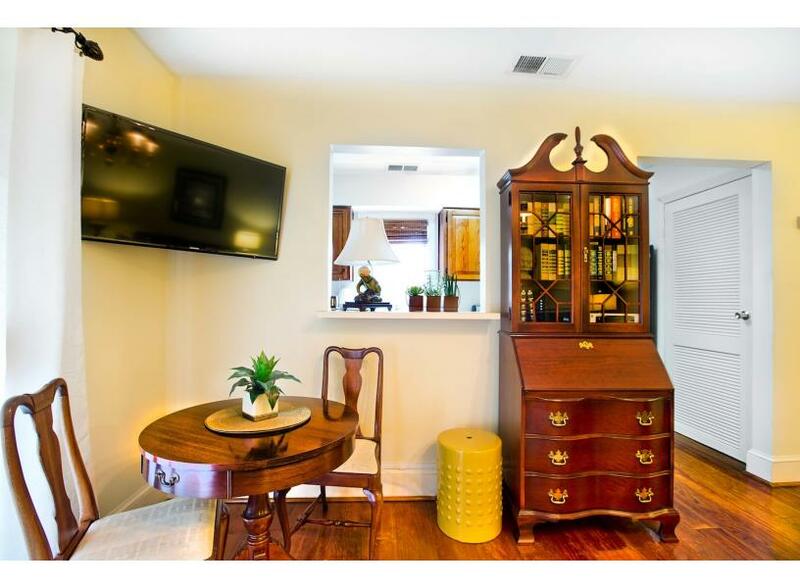 The home is in and excellent location near Forsyth Park. It's about a mile from River St., but writhin walking distance to Kroger (grocery store). The bed was very firm and comfortable. I loved the full kitchen and cozy living room. Over all ... No complaints. We would stay here again. Thank you for choosing to stay with Lucky Savannah! Lucky Lane is a great carriage house located fairly close to many great attractions, and the city's largest green space, Forsyth Park. We are happy you all enjoyed your stay, and would return to Lucky Lane! Please don't forget about our 10% "Returning Guest" discount. Great place for a romantic getaway. Sort of hard to find but its a wonderful little place. Thank you for choosing to stay with Lucky Savannah! We are so thrilled to hear you all enjoyed Lucky Lane Carriage House, for a romantic getaway. This home is tucked away, but thats what makes it so charming and quaint! We hope to have you all again in the near future. A wonderful Mother's Day weekend in Savannah. Thank you for staying with us at Lucky Lane. So glad you enjoyed your holiday weekend! great apartment for my husband, baby, and myself... location was within walking distance of everything to do and see. apartment had everything easily accessible to us and in good working order (AC, washer/dryer, dishwasher, etc.). I'm a clean freak so that's why I gave it 4 stars in that category- the bed, bath, and kitchen necessities were in very clean and good/new condition but the place could use a good dusting&sweeping/woodwork/deep cleaning too (and maybe update the covers for the vents). Would definitely recommend and/or return to this place though if we were to stay in Savannah again. loved the lucky savannah app and how i could use it for anything including checking in/out, accessing things to do, weather, contacting the company, etc. so easy and management was quick to reply when i did have a question. We had a really great experience, the detailed instructions sent in advance gave me all the information needed to locate the carriage house, find the key, etc. It was so nice not having to go somewhere else to check in, after a 9-hr drive! The property was exactly as described. I loved the proximity to Forsyth Park, they have a great playground for the kids, and I really enjoyed walking around the park every morning before getting coffee and scones at The Sentient Bean. The free shuttle has a stop just about a block from the carriage house. The carriage house was well stocked with basic necessities, and had plenty of room for 3 adults and a 2-yr-old. Carriage house was very nice, clean, etc. A/C could barely keep up - might want to invest in a replacement. Problem with A/C was addressed very promptly and professionally - thanks Joy! We will stay again if we return. We were happy with this apartment, as it was clean and quiet and we could park on the street outside of the building. The washer and dryer are modern and the tempurpedic bed was super comfortable. 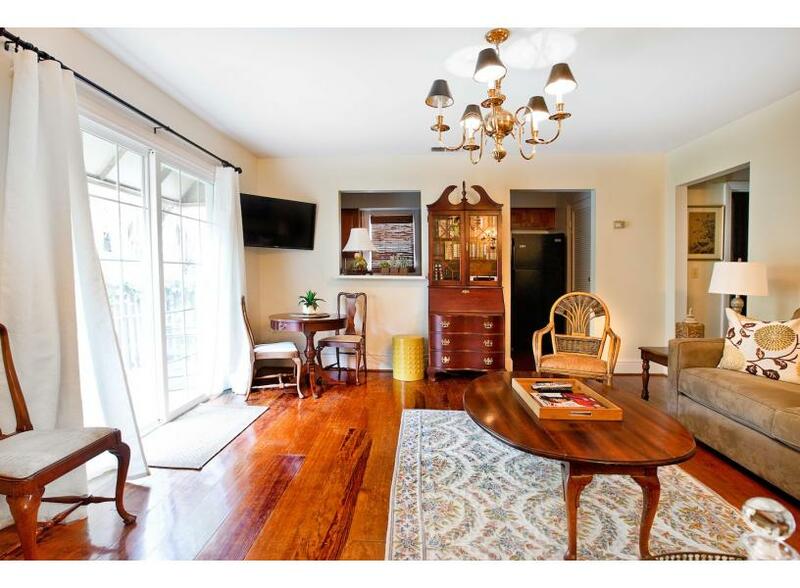 The pictures of the apartment make the floors, furniture, decor, etc. look as if they are in brand new condition..... A few things would make this a much nicer place, such as the small sofa could be replaced as well as the dated bath tub and the small toilet. The bathroom vanity doors wouldn't stay shut and the TV is old in the bedroom. Regardless, considering the price and cleanliness the apartment was a good deal. Fantastic place to stay in Savannah! We couldn't have been happier with the Lucky Lane carriage house. It had everything we needed for a 3-night stay. It really is within walking distance to everything; 1 block over from Forsyth Park (beautiful at night), the famous Clary's is right down the street for breakfast/lunch, Kroger for groceries is a couple blocks away. There were 2 of us on this visit and the space was perfect. The bed was really comfortable - it's quite firm, so if you prefer soft, this wouldn't be your first choice. Did not use the pull out sofa bed, so can't comment on that. Good water pressure in the shower! Plenty of closet and drawer space if you plan to stay a while. The entire space was extremely clean, and we enjoyed drinking our morning coffee out on the balcony. We will definitely reccomend this place to anyone visiting Savannah. A couple of notes; there is a cleaning fee, so he pricing that gets quoted to you will be higher then the nightly rate shown, and since this is above a garage, you will hear the garage door opening and closing when the owners leave. Excellent stay for me and my woman! Thank you for choosing to stay with Lucky Savannah! We are so glad to hear you all enjoyed your first trip to Savannah. We are thrilled the home was a great fit for you all, as well! We hope to have you as our guests again in the near future. Please don't forget about our 10% "Returning Guest" discount! A great location in a beautiful city. Thank you so much for staying with Lucky Savannah! We are so happy to hear you loved everything! We cannot wait to host you as our guests again in the near future. I loved the property, the owners, and especially the location. maintained,comfortable and spacious. The location was perfect--near everything worth seeing. I hope to be able to rent it again. Loved the location but beware of parking. Get the door code. We liked staying in the historic distric and in walking distance of groceries, parks and downtown. We had a problem getting in: the direction were to get the key that opened the gate but nothing else. There was a code to get into the cottage but we had to figure that out on our own, no answer when I tried calling Lucky Savannah. We had issues with parking; there was a Veterans Day parade and our car got towed. The posted signs did not specify a date for being a tow away zone and I believe all special event parking dates should be included in the rental information. It would have been nice to have a phone book - to find a cab to retrieve our car, instead we walked the 5 miles. 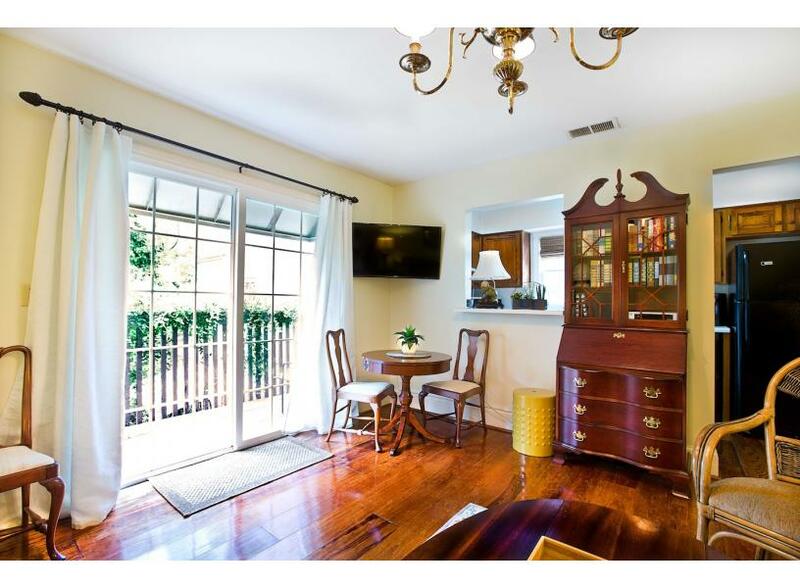 The location of the carriage house is perfect; right near Forsythe Park and an easy walk into town. Also, a grocery store is just a couple blocks the other way. The size is great for two, however we had a guest for 3 nights and it worked out fine. Kitchen is a little small, and not completely equiped for cooking, but we ate out most of the time anyway!! It was great having the washer and dryer on site, since we stayed 3 weeks. Manager answered all questions and responded to a few things we needed while staying. We would recommend this location for a visit to historic Savannah. A home away from home in a great location. Loved Savannah and the carriage house. The location was great. This was a wonderful place to stay! All the reviewers are correct. Clean, comfortable, beautiful, easy to get everywhere we wanted to go. The King sized bed was very comfortable. The kitchen was great for making breakfast and doing some thanksgiving cooking and baking. We would stay here again and heartily recommend! This was our first visit to Savannah and using vacation rental. The one bedroom unit was fantastic. Very clean and quiet. The unit was a short distance down an alley and above a garage. We felt very secure there. We were only 1 block from Forsyth Park and on the edge of the Historic District. We parked the car across the street, no need for a parking permit and walked everywhere. Walking back after dinner at 10:00 at night, felt very secure. The unit location is great. The unit has a small kitchen, very nice and large vanity area, nice for women. The bed was big and comfortable. The air conditioning worked great and was needed. Would use Lucy Savannah rental again for this unit or one of their others. Lucky Lane was a great vacation stay! The rental agency was wonderful and helpful. The only thing that I would suggest is that the rental has an old, uncomfortable sleeper sofa that we were unable to use. It needs to be replaced ASAP! However, if a couple is staying there only, the king size bed in the bedroom is more than enough. Would definitely rent again for one, instead of two who desire not to share a bed. We spent a very enjoyable week in Savannah. The Carriage was very nice with good space for two. All of the services etc worked well. We got 48 hour parking passes at the Visitor's center so that worked out well also. We would do it again.